The day after I do a VJ roundup, my friend Holly Daggers has turned VJing into a graphic novel. It’s wetcircuits presents VJ comix, a Flash-animated color comic book about the on-the-road life of a superstar VJ. Busta Rhymes, Miri Ben Ari, and All Mighty Senators are featured, plus a tour of unknown origin by a cigarette company of unknown origin (mmm, shady). 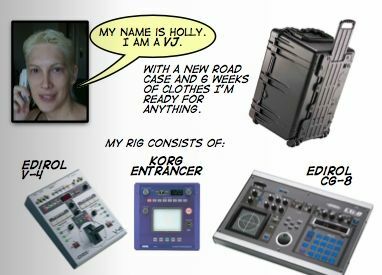 But what we care about, of course, is Holly’s gear, from Korg, Edirol, et al. Of course, the real reason I bring this up is I’d love to get some help making music-themed comics using plasq’s superb Comic Life. Any takers?